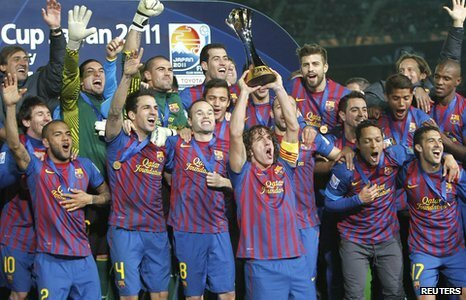 Barcelona were crowned FIFA Club World Cup winners when they thrashed Brazilian side Santos 4-0 in Japan. The win capped a remarkable year for the Spanish side in which they also won the La Liga title, the Champions League and the Spanish Super Cup. Argentine Lionel Messi scored two impressive goals with Xavi and former Arsenal midfielder Cesc Fabregas also on target for Barcelona. The win confirms Barcelona's standing as the best club team in the world.